Published: March 20, 2019 at 02:27 p.m. Updated: April 2, 2019 at 02:03 p.m. The NFL's free agency frenzy hasn't just affected the fantasy value of players who will wear new uniforms in 2019 ... there's also several collateral scenarios that have risen for the teams that have either acquired or lost talented assets. Here's a list of players who haven't changed teams but will still experience a change in fantasy value. 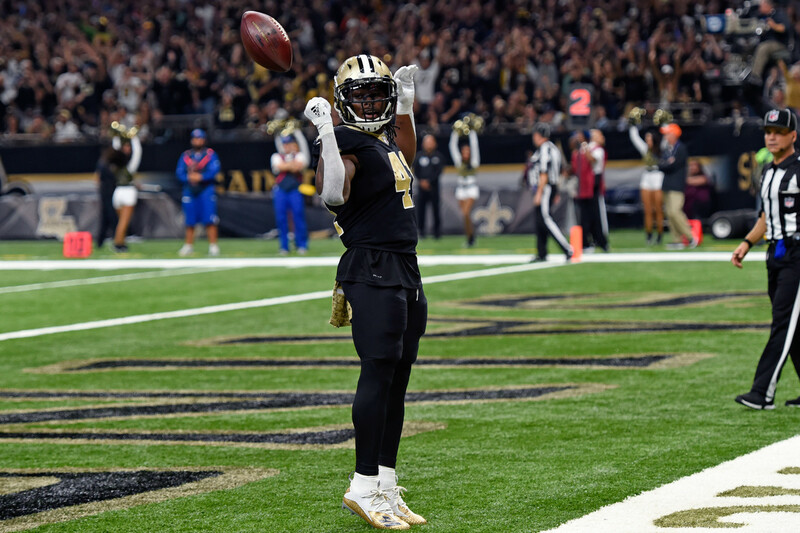 The departure of Mark Ingram will make Kamara even more valuable in fantasy leagues. In fact, he'll now be a top-three pick in most drafts. While the Saints did add Latavius Murray, he won't see the 15.9 touches per game that Ingram averaged over the last two seasons with the Saints. Here's the good news ... it'll be even harder for defenses to stack the box against the run with the Browns' addition of Odell Beckham Jr. Here's the bad news ... Chubb could end up the lead back in a committee situation once Kareem Hunt returns to the field after an eight-game suspension. This one is pretty obvious, as Smith-Schuster will now be the top option in the Steelers pass attack with Antonio Brown no longer in the mix. He'll see a strong share of the offensive targets from Ben Roethlisberger and should now be considered a low-end No. 1 fantasy wideout in drafts. Fournette needs to avoid injuries and keep his head on straight if he's going to rebound from a subpar 2018 campaign. But the good news is that the Jags added Nick Foles, who is far less turnover prone than Blake Bortles. That will keep the football in Fournette's hands more often. The addition of Carlos Hyde shouldn't affect Williams' status as the projected No. 1 back in Kansas City. Coach Andy Reid has always liked to use a versatile, featured runner, and Williams should be able to fill that role with statistical success ... much like he did at the end of the 2018 season. The Colts have a ton of money to spend, and some out there (including myself) were hoping they would use some of it to sign Le'Veon Bell. Well, Bell signed with the Jets and Indianapolis looks secure with Mack atop its 2019 depth chart. He'll have high-RB2 potential in the Colts' offense. The departure of Frank Gore is good news for both Drake and Kalen Ballage, who will now make up the Dolphins backfield. We would also hope that new coach Brian Flores leans on Drake as more of a featured back then former coach Adam Gase, who used Gore in a near even split in 2019. Some might suggest that the return of Adrian Peterson is bad for Guice's value, but Guice is happy to have the veteran back on the roster. The Redskins will be leaning on the run a ton based on their current roster, and A.D. provides insurance for Guice in his return from an injured knee. Godwin was one of my favorite sleepers of last season, and he'll graduate to breakout candidate now that the Bucs have parted ways with DeSean Jackson and Adam Humphries. Godwin, who plays on the outside or interior, should also benefit from the presence of new coach Bruce Arians. Landry's value took a hit after a disappointing 2018 season, and it took a further blow when the Browns traded for Odell Beckham Jr. No teammate of OBJ has seen more than 127 targets in a single season when Beckham has played in at least 12 games, so Landry's targets are likely to fall. Moore showed flashes of potential in the second half of last season, and the former first-rounder is now the No. 1 option in the Panthers' pass attack with Devin Funchess now in Indianapolis. In fact, he will be a popular breakout candidate and be well worth a middle-round choice in drafts. Howard is going to be one of my favorite breakout candidates for the upcoming season, at least among tight ends. The Buccaneers have traded DeSean Jackson and lost Adam Humphries to the Titans, so there's a lot of available targets in the Bucs' pass attack. Howard should benefit. Typically, the addition of a 35-year-old running back wouldn't hurt McCoy's value. However, that's not the case when that back is the ageless Frank Gore. While I would still project McCoy to lead this backfield in touches next season, Gore is going to get his share of opportunities as well. Was there a bigger winner than Mayfield? The Browns added an elite wide receiver in Odell Beckham Jr. to go along with a core of weapons that already included Nick Chubb, Kareem Hunt, Jarvis Landry and David Njoku. Mayfield now ranks sixth on my quarterback rankings for next season. The departure of Odell Beckham Jr. opens up a lot of opportunities in the Giants' offense, and Engram should be one of the main beneficiaries. We saw that toward the end of last season, as Engram was far more consistent in the stat sheets when OBJ was out of action due to injuries. Ebron was one of the best draft bargains in fantasy football last season, but touchdown regression is a virtual guarantee. That mindset was elevated even further when the Colts added Devin Funchess, who at 6-foot-4 and 225 pounds will see at least some of Ebron's red-zone targets. Williams has a ton of upside in the fantasy world, and his stock has risen now that the Chargers have lost Tyrell Williams to the Raiders. The Clemson product won't be a No. 1 option with Keenan Allen in the mix, but he could push for top-20 value based on his red-zone prowess. McKinnon was a fantasy darling last season before he blew out his knee, and his value took another hit when the Niners brought in Tevin Coleman. Coleman and coach Kyle Shanahan found success together during in Atlanta, so I think he's the Niners' fantasy back to own ... not McKinnon. Pettis showed some flashes of potential in the second half of last season, making him a legitimate breakout candidate in 2019. The Niners cut ties with Pierre Garcon and haven't made any additions at wide receiver this offseason, so Pettis figures to see a lot of targets next season. Penny didn't see a lot of touches as a rookie with the emergence of Chris Carson, but that should change with the departure of Mike Davis. In fact, coach Pete Carroll said he hopes to use a "one-two punch" with Carson and Penny in 2019. The latter will be a nice late rounder in drafts. MVS was a useful waiver-wire add for a short part of his rookie campaign, but he's now destined to see more targets from Aaron Rodgers with the departure of Randall Cobb. In fact, Valdez-Scantling was second among Packers wideouts in routes run out of the slot in 2018. He's moving up. Barber is the favorite to start for the Buccaneers, at least at this point, as the team didn't make a major addition at running back (unless you consider Andre Ellington). OK, maybe not. Ronald Jones is also in the mix, however, and the Bucs are likely to draft a back ... so stay tuned. Wentz is coming off a disappointing campaign, but his stock is back on the rise as the Eagles let Nick Foles walk and traded for DeSean Jackson. With no quarterback controversies to deal with a new weapon who can stretch defenses in his arsenal, Wentz will be a bounce-back candidate. The departure of Tevin Coleman to San Francisco moves Smith into a more prominent role for Atlanta in 2019. In fact, coach Dan Quinn said he will see a "significant increase" in touches behind Devonta Freeman in the offense. He's a nice deep sleeper to consider late in your fantasy draft. Washington lost a little of his luster when the Steelers added Donte Moncrief, but he's still going to be in the sleeper conversation with almost 170 open targets on the table after the trade that sent Antonio Brown to the Raiders. The OSU product will warrant a late-round selection in drafts. The No. 3 fantasy quarterback a season ago, Roethlisberger will go into next season as a fantasy backup with Antonio Brown no longer on the roster. Over the last five years, 28 percent of his pass attempts and 32 percent of his passing yards went to Brown. That's an enormous loss. McDonald will be a popular sleeper in fantasy leagues, as the Steelers no longer have Antonio Brown and lost Jesse James to the Lions. While he's had troubles staying on the field due to injuries, a healthy McDonald should warrant more targets and could be a top-12 tight end in 2019. Foster showed some flashes of potential at the end of last season when he emerged as Josh Allen's favorite target, but he lost value when the Bills added another lid lifter in John Brown in addition to slot man Cole Beasley. Foster is now worth more of a late-round selection in fantasy drafts. McGuire looked good as the Jets top back at the end of last season, but any fantasy value he might have had in 2019 was dashed when the team added Le'Veon Bell. He will remain second on the depth chart with the release of Isaiah Crowell, but McGuire now has very little draft value. Like McGuire, Edwards saw a greater role in his offense in the second half of last season. He won't get a chance to keep that role, however, as the Ravens added veteran Mark Ingram to be their new featured back. Gus the Bus should now be seen as no more than a potential fantasy handcuff.